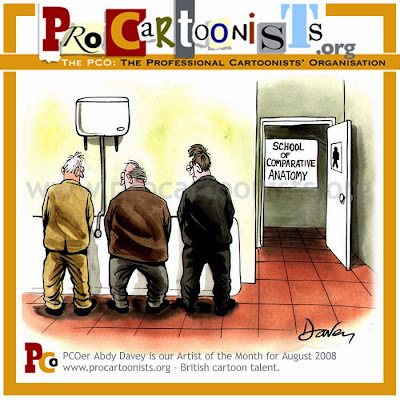 Here is the last interview answer from Andy Davey our PCO Artist of the Month for August 2008. Bloghorn asked him what’s the future for cartooning in the digital age? I’m sure cartoons will thrive and flourish, after they emerge from this difficult period, but in what form they will do this, I have no idea. It may be that animation will provide the extra selling point they seem to need in the rush to digital. It seems many people under 30 now think of animated cartoon art when they hear the word “cartoon”, so the deed may be already be done. It’s increasingly difficult to get any kind of still, newsprint cartoon published at a reasonable fee, so it may have become less attractive to new entrants and this may lead to a downward spiral in the quality of work. But there are, still, good new people coming in*. Interestingly, the route to being a cartoonist is usually circuitous or tangential; there aren’t any really useful training schools. This means it still attracts lateral thinkers, oddballs and eccentrics – thank goodness. Long may it do so. Satire and drawn humour are as natural (and enduring) as camel farts. The art-form might mutate but it won’t die. Bloghorn says click D for Davey. It’s something all cartoonists dread: you open up a magazine and see one of your precious works in print but they have done something to it. It may be a changed caption, an amended drawing, the cartoon has been printed too small … whatever, it’s a bit annoying. Here, cartoonist and blogger Mike Lynch takes a US magazine to task for printing captions over the drawing! The PCO team for this year’s London Big Draw event is confirmed. Team skipper, Pete Dredge (Private Eye regular) will be leading Robert Duncan (Not particularly orange cards), Kipper Williams (The Guardian) and Royston Robertson (Prospect, Readers Digest, Private Eye) into the suitably absurd Battle of the Cartoonists. The 12 feet long, two-hour epic PCO banner from 2007, hung up, or out, to dry. You can find details and a report from Bill Stott on the 2007 event here. PCO members will also be running workshops throughout the day, featuring the many coloured skills of Tim Harries, Chichi Parish, Matt Buck, Andy Davey and Paul Hardman among others. We will be publishing more details in the run up to the big day on Saturday 18 October. 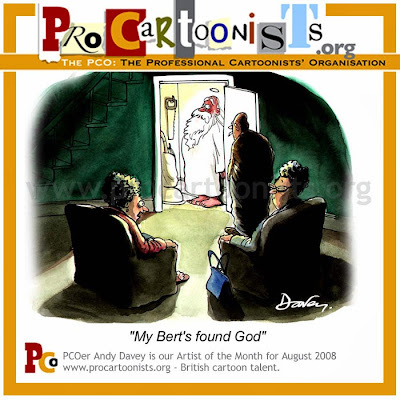 Andy Davey is the PCO Artist of the Month for August 2008. Bloghorn asked Andy some questions about what he does. Which other cartoonists’ work do you admire? 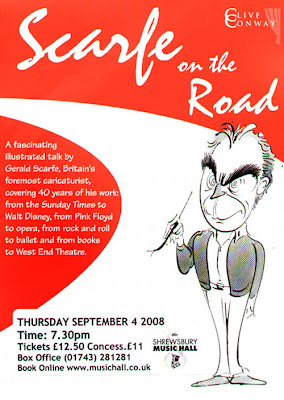 Gerald Scarfe’s loose, carefree line, devastating caricature and command of so many styles is still pretty breathtaking. 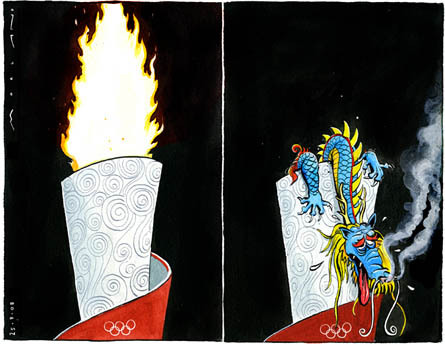 Steve Bell’s ability to nail a politician and produce the definitive image of the hapless soul (Major, Blair, Bush) is unparalleled. Matt’s ability to translate world events into demotic scenes of suburbia. Then there are the others – Robert Crumb for his weird Freudian cathartics. 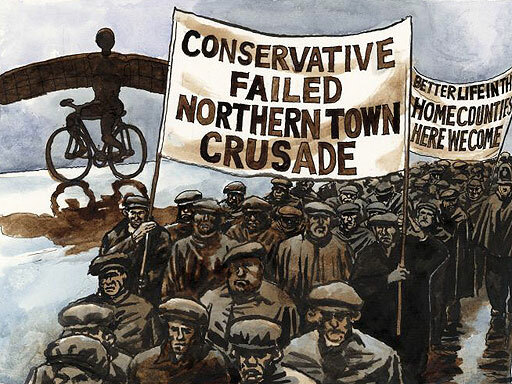 Thelwell for pretty much the opposite. Ken Reid, Tony Husband, Ray Lowry, Ralph Steadman, Larry, Ed McLachlan, Posy Simmonds … oh, and that Bill Stott fellow. There are many others. Anyone who makes me laugh out loud gets a special gold star. Do you have any tips for wannabe cartoonists? Oh bejayzus. At present, it looks like it would be recommending someone to train as a cordwainer or a wheelwright. Of course, there are several dozen scribblers making a good living out of it – and even cartoon Forbes-listers (Messrs Bell, Pritchett, Scarfe) but the rest of us live on hope, rejection and frozen peas. BUT, if you love doing something, then you just can’t stop yourself pursuing it – and it would be foolish to do so (as I have demonstrated to myself). So if that’s what you enjoy – DO IT, fer gawd’s sake, or you’ll regret it. 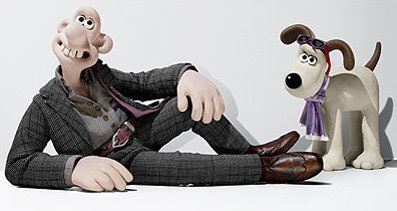 Worry about the penury later – when the skinny-dog and pennywhistle combo begins to look like an upward career move. Scarfe is one of Britain’s most popular caricaturists and is political cartoonist for the Sunday Times. For more details on this illustrated talk, which spans his 40-year career, see the above flyer (click to enlarge). You can book tickets here. Shrewsbury is no stranger to cartooning as every April it hosts the Shrewsbury International Cartoon Festival, the foremost event of its kind in the country. Ever wondered why some newspaper cartoons have so many symbols and badges in them? Let PCOer Martin Rowson explain a little about it in this Radio 4 interview about the symbolism of Russia as a giant bear. Clip from the Today programme. Jack Ziegler in the New Yorker – on superpowered rivalry.